Are you confused by all the numbers and terms that people use in reference to paracord? Type III, #750, mil-spec, breaking strength, tensile strength, para-max, 550 lbs, Mil-C-5040, etc. What does all that mean? Is it even important? In this post we will explain the terminology, types, and numbers relating to paracord. After reading, you should have a better idea of what paracord is and what kind you may need. If you have no idea what paracord is, read this post first! 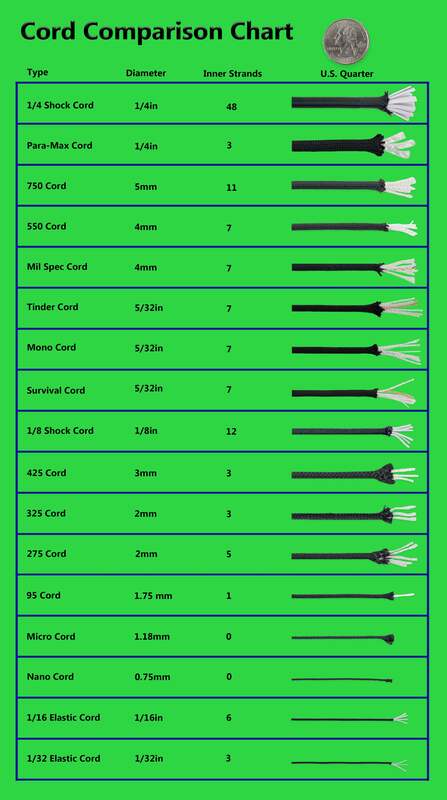 If you want a list of all the available types of paracord, along with their specs, take a look at our paracord comparison chart. If you want an explanation of paracord jargon, and a general overview of why things are called what they are, keep reading! Paracord was originally commissioned by the United States military during the second World War for use as parachute suspension lines and utility purposes. It was engineered to be strong, light, and slightly elastic. Because people's lives literally depended on this rope, military paracord had to undergo certain certifications to be acceptable for use. You can buy such paracord today as Mil Spec C-5040 Type III paracord. Let me explain what that means. While most people today use commercial grade "550 paracord", there are a few different other "types". Here is a breakdown of the different types of paracord commissioned by the U.S. Military, along with their most basic specs. The rest of mil-spec paracord requirements can be found in this document: Mil-C-5040. The different types of paracord are not so much types as they are size and strength ratings. (If you see a "#" in front of a number on our site, it usually is the weight rating of a cord.) Today, it is fairly uncommon to find Military-Spec paracord in any type but Type III (550 lb.). Paracord Planet also carries Mil-Spec 750 Type IV (750 lb.). The other types of paracord, and most of the Type III paracord, produced today is "commercial grade". This means that the strength rating is still tested, just not to the extent that the military would require. If you want real Mil-Spec paracord, you can find it here. Each of these types of cord comes in various color options, including: solid, multi-color, camo, reflective, and glow-in-the-dark. Visit our color comparison chart to browse these options. People who work with ropes, specifically paracord, use some terms that might be unfamiliar to the rest of us. Use this list as a glossary. A nylon Kernmantle rope formerly used in military parachutes. Now used for survivalcraft and various hobbies. True paracord is made from nylon, giving it great strength for its weight. Nylon is highly elastic and is resistant to rot, mold, and UV light. Similar to nylon, but faster drying, less strong, and less elastic. Cheap imitation paracord is often made from polyester. Paracord that lives up to military specification 5040, is said to be Mil Spec. Many brands of paracord will claim to sell Mil Spec, but do not sell true military certified paracord. This is the document that specifies the requirements for military paracord. You can read a PDF copy here or read the summary in this blog. 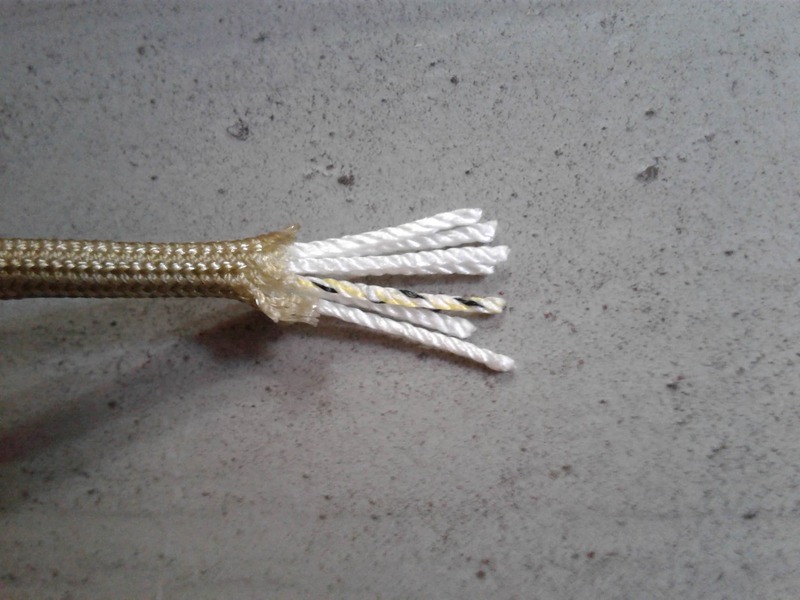 A rope that has inner strands surrounded by a braided sheath. The outer, braided sleeve of kernmantle ropes. 550 paracord mantles often have 32 strands. The inner strands of a kernmantle rope. A paracord core will be made up of between 1-11 yarns, which are each made up of 2-3 smaller strands, which each consist of many individual nylon fibers. The inner core strands of paracord are called yarns. The amount of stress a rope can take before breaking. Often preceded by a "#" to signify lbs. It should be noted that a falling object or person will put many times the stress on a rope that a stationary object will. A 200 lb. person could easily snap a strand of 550 lb. rated paracord when falling. The length that a rope can be pulled to, and then afterward return to its original length. Paracord must have at least 30% elongation. Are you on information overload yet? To make it simpler: If you want to have some general purpose cord laying around or worn in a bracelet, go with standard #550 cord. If you foresee yourself using paracord for survival often and want to go with a higher strength product, go with Mil-Spec #750. We are constantly adding new products to our store. Is there anything you would like to see us carry? Let us know in the comments below. Last week, Isabel and Pat commented and won 100 ft. of #95 paracord! This week, comment to win 100 ft. of #275 paracord. Want to hear more about the world of paracord, crafting, and survival? Subscribe to our newsletter!